Increasing rubber monoculture plantations (Hevea brasiliensis) has driven land-use/ land-cover changes in Xishuangbanna over the past four decades, which caused loss of natural forests. In recent years, the local government has proposed building environmentally friendly rubber plantations (rubber-based agroforestry systems) which aim to reduce water and soil loss. Although such systems can be highly effective in fixing carbon, and are thought to be economically viable and ecologically sustainable in this region, little is known about their effects on controlling soil loss, especially on rain splash erosion. Prof. LIU Wenjie and his team of Xishuangbanna Tropical Botanical Garden (XTBG) evaluated the influence of different types of rubber-based agroforestry systems and rubber monoculture on soil erosion processes. The study focused on changes in throughfall erosivity and plant characteristics which are related to their effects on splash erosion potential. By using sand-filled Tübingen splash cups, the researchers measured rainfall and throughfall erosivity (splash erosion potential) in an open environment and under different types of rubber-based agroforestry systems and rubber monoculture. 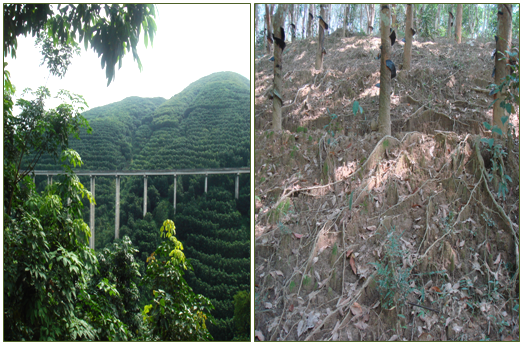 The data obtained under the five types of agroforestry systems (rubber-tea, rubber-coffee, rubber-cacao, rubber-madarine orange, rubber- Flemingia macrophylla) showed that in all but one system (rubber-tea system) there was more sand loss beneath multiple-layered canopies than in the open environment. 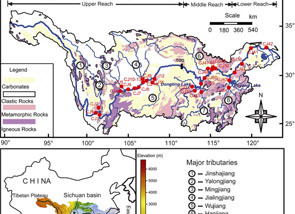 Except in the rubber-orange system, there was a significant reduction in sand loss beneath the multiple-layered canopies compared to single-layered monoculture, especially for the rubber-tea system. Thus, the rubber and tea system was the most effective in controlling potential erosion. 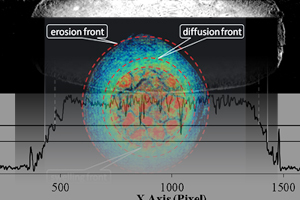 They also found that the erosion potential under the forest was closely related to the forest structure, especially height and canopy cover. Low canopy height with high sub-canopy coverage was the major control on the amount of splash erosion, regardless of how the splash potential was increased by the canopy above. It’s important to select low near-surface intercrops for constructing rubber-based agroforestry systems. The study also accentuated the importance of an intact litter layer in rubber plantations to protect the soil against splash erosion. The study entitled “Are rubber-based agroforestry systems effective in controlling rain splash erosion?” has been published online in CATENA.